California Orange Bud feminized is such a potent plant that even the smaller leaves are covered with shiny resin. 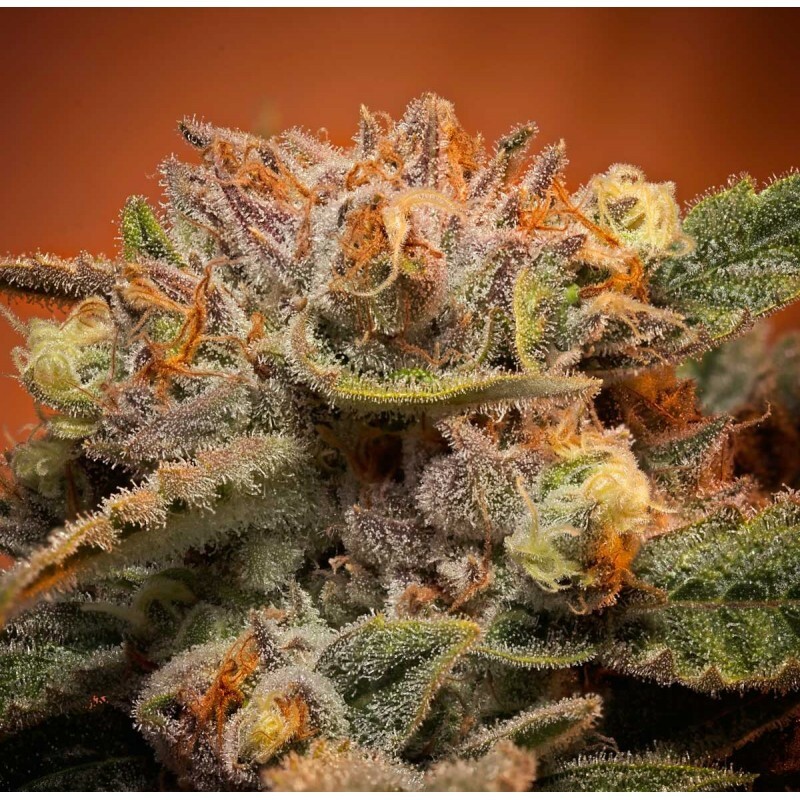 California Orange Bud feminized is a minimal dare for the less experienced growers but very easy for the more experienced ones and grows well in most of the existing growing conditions. A so called medium maintenance plant that shows it's gratitude by good quality buds and amazingly high yield. Although she is mainly Indica she won't grow very tall what means she is very suitable for growing with limited space whether you grow her in- or outdoors. The odour the buds are spreading can be called fruity like citrus fruit and with their beautiful long orange brown hairs she really lives up to her name. When the buds are being consumed the fruity citrus taste will help the uplifting effect you get and a very energetic body high will take over without leaving you locked in your couch. One of the famous outdoor seeds from California, Orange Bud originally hails from Holland, and it was discovered in the early 80s. It can be cultivated indoors and is suitable for greenhouse growing conditions. It is an awesome cannabis strain with loads of zest and power in terms of both performance and taste. It can make you go high with just a fewpuffs, and offer a delicious, sweet citrus aroma. The purchased seeds from this company mainly require sunny climatic conditions and hence offer best quality seeds when cultivated during summer. Their sellers claim that, the features from the Indica strain is highly expressed in some breeds and so does the Sativa traits, which gives wonderful opportunities for farmers in outdoor cultivation process or in the indoor cultivation process. The flowering stage is pretty short and one can smell the essence of orange throughout that period. Balancing the orange flavor, it has thick clumps of pistils over resinous, solid buds. Apart from the orange flavor, the plants when fully matured can turn orange in color than usual green, resulting in a colorful yield. It hasgenetics with a sweet flavor and great sweet orange aroma. Originally from California, being brought from Holland in early eighties, it is suitable for indoor and greenhouse growers. It is one such rare strain that has lot of effects in terms of both performance and flavor. Apart from the pleasant orange taste, it features lot of pistil clumps, which produce sticky, solid buds. Winning several cups in eighties and nineties, it remains a classic strain, which is suitable for any cannabis grower. The smoke is quite cerebral, uplifting and highly potent for unique taste of ripe orange with clear citrus tone. Each bud formed from the seeds that are bought and cultivated from the experts team of the company will be around 500 to 600g from both the indoor and outdoor cultivation process. The buds will be coated with orange or deep pink coloured thick hair to protect them from any external harm. One the best plants I have ever grown, great taste, worthy of your time. Nice,sweety and the best Weed World Wide..!!! Will you ship discreetly to ohio? I'm trying to buy three California orange seeds, but it's not letting me put the number 5 in. Olá boa noite, quantos dias leva pra chegar no Brasil? The verbal description says mostly sativa, the chart says mostly indica. What is it ??? thx for the info, it is indica. we changed it now. How long is shipping to California?